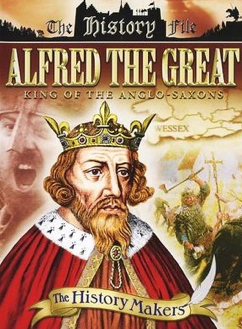 Alfred the Great lived from 849 AD till 26 Oct 899 AD. Alfred is the 7th great grandfather of Count Poitou William, the 14th great grand uncle of Sir Edward Southworth, the first husband of Alice Carpenter, my 7th great grandmother, my being descended through her second husband, Plymouth Colony Governor William Bradford. Various descendants of Alfred's were related to my ancestors. 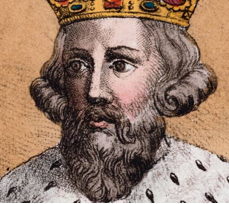 For example, King Edward the Confessor, the third great grandson of Alfred's was a first cousin, once removed to King William the Conqueror, my seventh cousin, 26 times removed. Alfred was one of the greatest men in history. He founded the British Navy, organized the militia, compiled a code of laws, built schools and monasteries, and invited scholars to live at his court. He was a good scholar and translated many books himself. Edward Southworth, the first husband of Alice Carpenter, my seventh great grandmother by her second husband, Plymouth Colony Governor William Bradford is the 14th great grandnephew of Count of Nantes, Geoffrey, the 7th great grandson of Alfred. Southworth also is my 25th cousin, eight times removed. Alfred is the 38th great grandfather of our Westmoreland grandchildren, Katherine, Jack, Lily, Sarah and Sam. 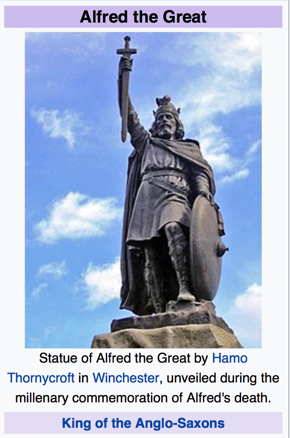 Alfred the Great was king of the West Saxons in southwestern England. He saved his kingdom, Wessex, from the Danish Vikings, and laid the basis for the unification of England under the West Saxon monarchy. He also led a revival of learning and literature. He was such an outstanding leader in war and peace that he is the only English King known as "the Great." The nomenclature of �the Great� derived from his accomplishments. In comparison, the other well-known use of that title was for Charlemagne the Great. His �Great� came from his towering height as a man, being six foot, four inches. That matches the height of the tallest United States President, who was Abraham Lincoln! Alfred was born in Wantage (now in Oxfordshire), England. He was the youngest son of King Ethelwulf of Wessex. According to the Welsh writer, Asser, who wrote a biography of Alfred shortly after his death, Alfred was always eager to learn. Asser says that Alfred's mother offered a book of Anglo-Saxon poems as a prize to the first of her sons who could read it. Alfred won. As a boy, Alfred went to Rome twice, where the pope acknowledged the status of the royal house of Wessex. The journeys also showed Alfred the contrast between England and the more advanced parts of Europe. Alfred became king in 871 at the death of his brother Ethelred. The West Saxons had been at war with the Danes for many years. After several losing battles, Alfred made peace with the invaders. But the Danes renewed their attacks and defeated Alfred at the Battle of Chippenham in 877. Alfred then defeated the Danes at the Battle of Edington in 878. The Danish leader, Guthrum, agreed to be baptized a Christian. He also agreed to stay north and east of the River Thames, in an area called the Danelaw. However, the Danes broke the peace, and Alfred renewed the war. He won London in 886. All the English people not subject to the Danes recognized Alfred as their ruler, and paid him homage. The old, independent Anglo-Saxon kingdoms began to merge under the rule of Wessex. Alfred built forts and boroughs (fortified towns) at strategic points. He stationed his fleet along the coast as protection against further invasions. He also issued a code of laws to restore peaceful government. Before Alfred, education had declined in England, because the Danes had looted monasteries and churches, which had been the centers of learning. Alfred revived learning by bringing teachers and writers from Wales and continental Europe. He encouraged the translation of famous Christian books from Latin into Old English. Under his influence, the Anglo-Saxon Chronicle began to be compiled. now the main source for Anglo-Saxon history up to 1154. The reign of Alfred was known for more than military success. He was a codifier of law, a promoter of education and a supporter of the arts. He, himself, was a scholar and translated Latin books into the Anglo-Saxon tongue. The definitive contemporary work on Alfred's life is an unfinished account in Latin by Bishop Asser, a Welshman, bishop of Sherbourne, who also was Alfred's counsellor. After Alfred's graduation to Heaven, he was buried in his capital city of Winchester." Although Biship Asser�s "Life of King Alfred" was similar to the Anglo-Saxon Chronicle in its analystic approach, the Bishop personalized his writing so that the man Alfred was presented, and not just the Christian king who vanquished the pagan-based heathen kingdom. Asser's "Life of King Alfred" differs also in its use of Latin, rather than the vernacular in which most sources from Alfred's reign are written.